4 sides are 20" high 14 gauge steel. Durable 12 gauge steel bottom shelf, 3/16" thick angle corners & top frame, and 12 gauge caster mounts for long lasting use. 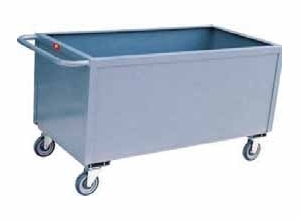 Overall height — 27" (31" with full pneumatic casters) — see options.